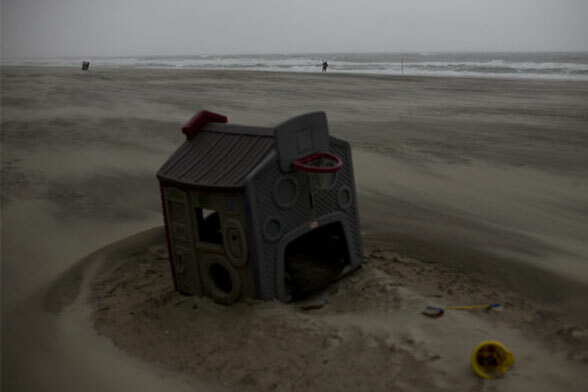 This photo was taken up on the far end of the Rockaways in New York. It was during a easterly wind storm that was battering the coast. The wind was so strong it had swept the beach clean of any markings. If you look in the background you can see a kitsurfer rigging up on the shoreline. It was taken in November, so the surfer is no doubt wearing a hood, gloves and booties for the cold. About an hour after this photo was taken, the wind switched and went offshore. For a couple of hours we surfed perfect waves down on one of the jetties in Rockaway before it was blown flat. It’s like that in New York, you have to be on it to get it, because the weather and wind moves so fast. The photo was taken with a Canon 5D, using a 50MM lens. I like taking pictures of things that are happening. The coast is good for this because it is always moving and changing. Also people interact with the beaches, the shoreline and the ocean in their own special way. It’s very personal. It like photographing these things from a distance because there is a pure spirit involved.